Witney Trophy Centre is a family run business, John Winstone, Carole Winstone and their daughter Rachel Harris are a great team. They have been engraving trophies & awards at their Witney store in Oxfordshire for over 19 years. Historically the business was established around 60 years ago and began life in Cowley. All of the engraving of our glass and gifts and trophies is done on site at our Witney Shop, during our busy times there is a two week lead time for larger orders. We have clubs and sporting associations who have regular end of the sporting season award ceremonies who have been coming back to us for years and for whom we keep a stock of bespoke club badge medals and awards. 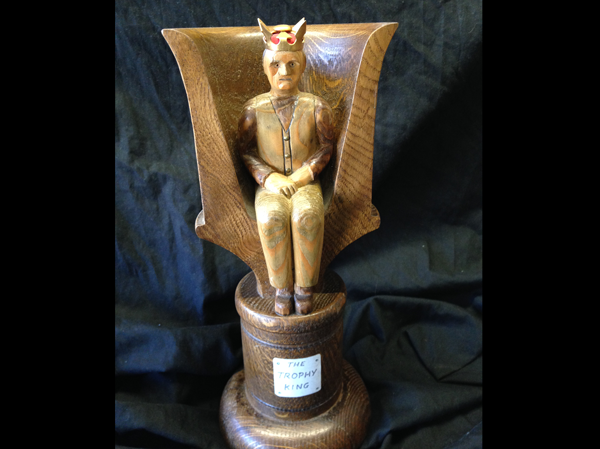 John has even been called "Trophy King" by the wood carver in Bampton who skillfully carved the statue in the trophy in this illustration. Mary Anne from NuNet who designed the website asked John "is there anything that you can't engrave within reason? ", John straight away replied "If we can hold it then we can engrave it!". You can bring your object in to us to be engraved, such as a favourite wine glass for a witty quip, or a metal plate from a memorial bench for additional text, we can help with text matching or advise replacement. Please take a look at our video showing the engraving process from start to finish. As an example we have engraved a small brass name plate, the whole process takes around half an hour, we felt the need to speed things up for the purposes of this engraving example video.